Spending a quiet evening at home by myself tonight. It’s funny how I can simultaneously breath easier and also feel just a tiny bit lonely at the same time. Does everyone feel that way when they’re alone? I just finished a delish dinner – stir fry with chicken, mushrooms, orange pepper, red pepper, snap peas, kale, garlic, capers, and a little lemon juice and olive oil. Plenty of leftovers for tomorrow, which is great since it’s my open-close day and eating the same meal, at work, twice in one 11-hour shift is a little much. I find cooking for one is difficult in many ways – I generally make way too muc h food, some of which is savable as leftovers, some of which just feels wasted; I usually don’t want to take the time to make a complete meal for myself when I’m the only one eating it; and there’s no one to help me with the dishes afterward. When I first recognized this “cooking solo” problem, I, of course, went out and looked for a book on this topic. 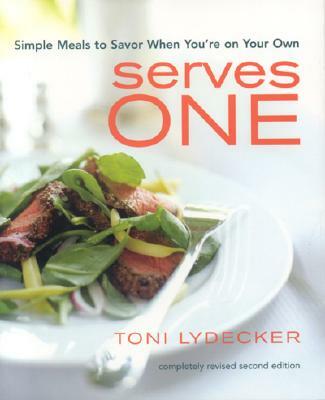 I came up with Serves One by Toni Lydecker. This has great suggestions for how to save excess food, time-saving advice on prepping before-hand, and tasty recipes from beginner level to advanced, all for cooking for just one person. If you find yourself in the same bittersweet situation of being perfectly content single, yet have some difficulty cooking for one, I highly recommend checking this out. I’ve been informed of a gross oversight on my part this week: I completely missed National Grammar Day! Officially held on March 4th, I am belatedly wishing you all a very happy Day. Apparently, according to this website, some people hosted Good-Grammar Potlucks and drank Grammartinis. Given my penchant for potlucks, this sounds like a fabulous idea (while at the same time, may be winning the “dorkiest potluck theme” award). Something tells me this will never quite make it into the same type of recognized holiday category as, say, a President’s birthday or when the date is 4/20. Nevertheless, I firmly resolve to celebrate this day with a vengence (or at least a potluck) in 2010, and I take this opportunity to invite you all personally (in this impersonal blog post). Hope everyone is having an equally lovely evening. Bo Diddley’s playing on my iTunes, I’ve got a cup of hot tea, and I’m about to go watch me some America’s Best Dance Crew. Life doesn’t get much better than this, folks. There's a National Grammar Day? And I didn't know about it? That makes me sad. What's in a grammartini? Does one drink them in Grammarcy Park? I believe one CAN drink a Grammartini in Grammarcy Park, but it is not necessary. If you would like to drink one in the comfort of your own home, or perhaps from a flask during a slow Sunday afternoon at a certain bookstore, here is how you can make one of your very own:How to Mix a Perfect GrammartiniPour two-and-a-half ounces of gin, a half-ounce of dry vermouth and several ice cubes into a martini shaker.Shake. (The shaker—not your body or your dog’s paw. )Strain into a chilled martini glass and garnish with an olive. If you must, use a lemon twist instead. The Society for the Promotion of Good Grammar likes olives, however. When life hands us lemons, we make lemonade.Enjoy!